Dave Lefebre said his best area was ruined by Monday's rainfall so he caught all of his fish out of his backup area today. 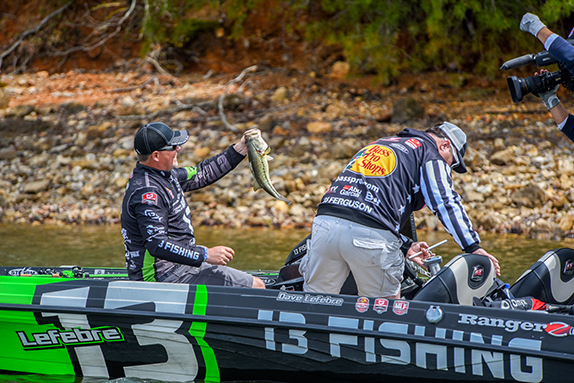 If today’s MLF Bass Pro Tour results are any indicator of what the fishing is going to be like at Lake Chickamauga this week, look out! The numbers posted by Group A seem like they’re straight out of a video game as many of them dwarf previous highs from this season. 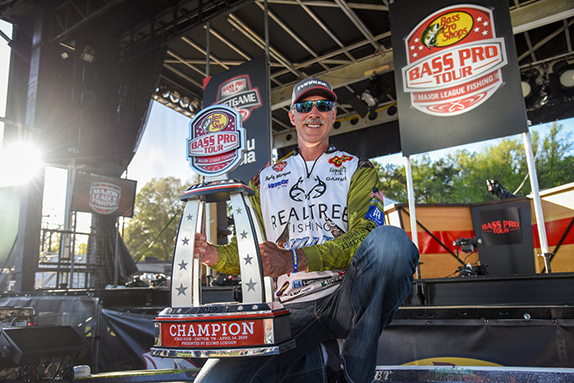 > Total bass caught: 705 (the previous single-day high in the Bass Pro Tour was 473). > Total weight caught: 1,396-05 (the previous single-day high was 935-00). > Anglers with 50-plus pounds: 6 (in the previous three events combined, the 50-pound mark had been reached eight times). > Anglers with 30-plus fish: 3 (that had only been done once before this season). All that and most will tell you the conditions were less than ideal. It was a banner day, though, for many competitors who feasted on a lake full of bass starting to flood the bank to spawn. When 3:30 p.m. rolled around, marking the end of the day, Dave Lefebre was atop the leaderboard with 59-14. His 34 bass matched Marty Robinson’s record for most fish caught in a single day. While excited about where he’s sitting, Lefebre knows he could’ve piled up more weight. His biggest fish was 3-06. “You’d have seen more if the water didn’t muddy up,” Lefebre said. “Every bed fish I found I couldn’t see because of the water. Aaron Martens caught almost half as many fish (18) as Lefebre in piling up 57-03, which has him in 2nd. Jordan Lee caught 24 fish and has 55-08 in 3rd while Brandon Palaniuk tallied 54-12 (26 fish) to occupy 4th. Mark Rose swung 31 bass into the boat for 53-08, good for fifth. 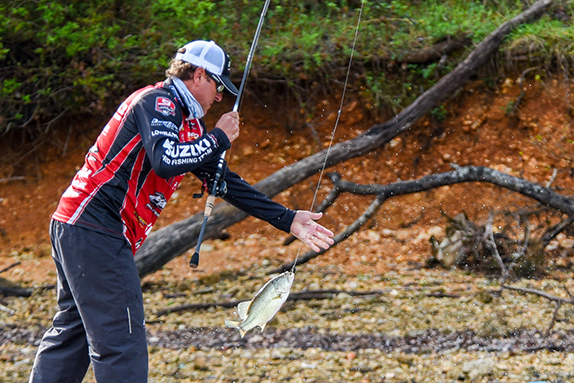 Justin Lucas (6th) also eclipsed the 50-pound mark as he looks to make his first Knockout Round of the season. Keith Poche (7th) was the other angler to catch 30 fish. 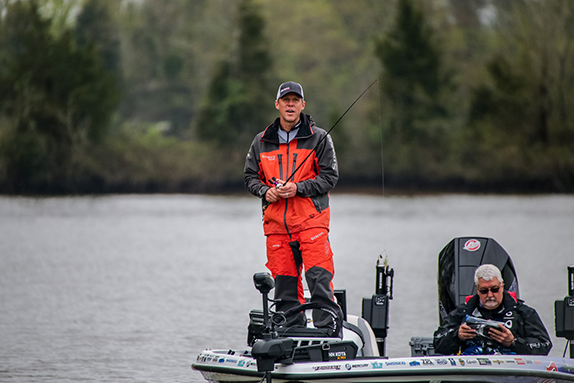 It seemed the only thing that kept the catch totals and weights from climbing higher was the stained and muddy water that resulted from more than an inch of rain that fell Monday. The water continues to rise slowly and with water temperatures in the 60s, that’s a recipe for more fish to move into obvious spawning areas. The Group B anglers will enjoy sunny skies Wednesday with a light breeze, so any areas that clear up in time could be ripe to be sight-fished. Aaron Martens caught six bass today that weighed four pounds or more. Lefebre said he wasn’t concerned with being the Group A leader until he worked his way to the top later in the day. He was 12th after the first period with 18-00 and moved up to 4th by the end of the second. He caught nearly half of his fish (16) in the third and tacked on 23-15 while swapping the lead with Martens. “I was telling myself it doesn’t matter to win, but when I got the lead with 90 minutes left and I saw Aaron passed me, I really wanted to lead because I was already there,” he said. In the third period, he made the decision to keep fishing productive water rather than back off or search for new areas. “I thought about conserving, but with the days to come, I figured that’s stupid with so many fish coming and going and all the locals out here and Group B fishing tomorrow,” he said. He figures it’ll take close to 80 pounds to advance out of Group A, so he wanted to get as close to that number as he could today. As nice as the $500 bonus for leading after today would’ve been, Martens said he was focused more on later in the week. 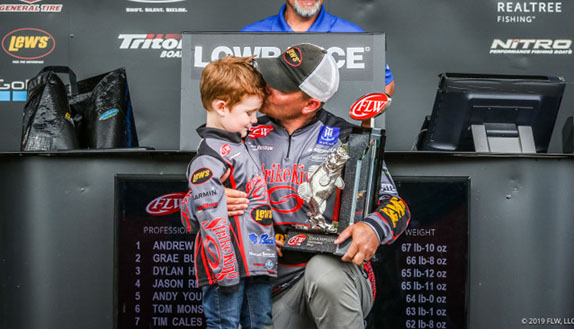 If he maintains the 3.2-pound average that he caught today (nobody else averaged more than 2 1/2 pounds per fish), he’ll be a lock to make his third Knockout Round of the season. Six of his 18 fish were 4 pounds or bigger, including a 6-07 he caught in the first period and a 7-07 he caught just after noon. Dean Rojas started fast today with more than 33 pounds in period one, then shifted into "wait-and-see" mode. It was an enjoyable day for Lucas, who came into the week 72nd in points after three lackluster finishes to start the year. He started slow with three fish for 7-09 in the first period, then racked up 21 bass for 43-01 over the final two periods. He made the most of the areas he had after having to bypass a number of stretches because of the water clarity. He felt the key to his day was a 30-minute stretch early in the second during which he caught six fish for 10-03. Sixteen different anglers caught at least 20 pounds in a period today. Dean Rojas set the pace in the first period with 33-11 (16 fish). 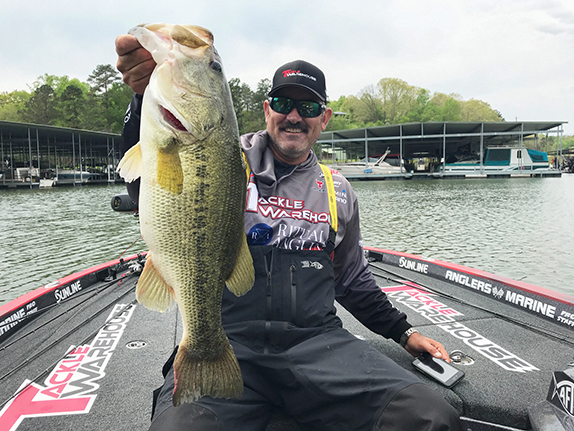 He retreated from his productive area in the last two periods and caught just two fish the rest of the way, dropping him to 18th with 36-14, roughly 2 pounds above the top-20 cut. He’d hoped to find other areas to expand on, but that search will have to continue Thursday.